It’s so hard to believe that it’s almost Halloween! You know what this means don’t you? It’s time to…well…put away your scale. I’ve already begun to have conversations with myself about NOT dipping into the trick or treat candy. The conversations go something like this: “You don’t need that, you’ve had it before, it tastes the same” – and then I eat it anyway – AUGH! Halloween marks the beginning of the end for me…the end of the year that is. I will be cooking and overeating nonstop from now until New Year’s Day. I actually bought my first can of cranberry sauce for a salad dressing, and began to dream about ginger bread cookies. Sorry, I can’t help but jump ahead. The best part of it is that I’m already looking forward to New Year’s Day. We have a family tradition of going to the Rose Bowl Parade in Pasadena. The parade is nice, but you want to know what I’m really looking forward to? Eating a bacon wrapped hot dog from a street vendor at 7 a.m. Sounds crazy I know, but you can’t mess with tradition. You just have to do it. What are your Halloween traditions that mark the beginning of the holiday season? Fight with my son about his costume not being too scary. Pull out my multitude of fake pumpkins and hope the Santa Ana winds don’t blow them away. Medicate my dog’s food in her Mason Cash pet bowl so she won’t have a heart attack. Pull out the holiday decoration and eat Snickers bars. Make a huge pot of low fat, high fiber, healthy turkey chili, and then pile on cheese and sour cream. 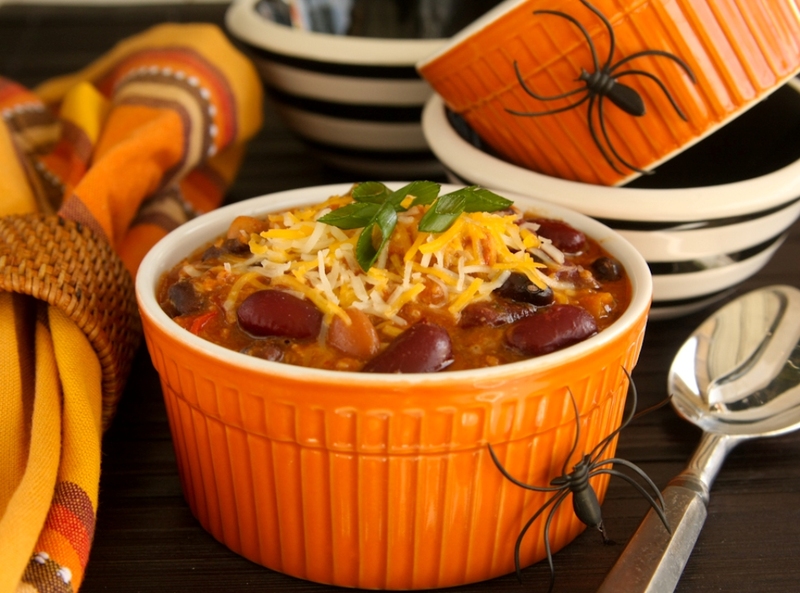 Homemade Bean Turkey Chili is one of my favorite fall treats. 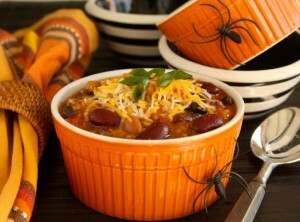 I can’t think of a meal more perfect for Halloween evening to energize the little ones before a long night of trick or treating. It’s warm, hearty, and quick and easy to prepare amidst the hustle and bustle of the day’s holiday activities. The smell of it simmering on the stovetop, how it looks in my favorite Mason Cash Pudding Basin and, of course, the mouthwatering taste can’t be beat. The perfect presentation is almost as important as the taste – almost! My eyes feast first, then my taste buds, and it couldn’t be a more divine moment. As a chef I use a wide array of kitchenware when I cook and serve meals, but I have to say the Mason Cash and Acacia wooden products from Pacific Merchants are some of my absolute favorite go-to pieces, and are the perfect “assistant” in the kitchen. I especially love using my hand carved Calabash Acacia Dipping Bowls to prep my ingredients when I’m cooking chili on a breezy fall afternoon. And my Mason Cash Mixing Bowls and Pudding Basins are both beautiful and versatile. The Pudding Basin’s sleek design lends itself well to be used as a mixing bowl, serving bowl, pasta bowl, ice cream and cereal bowls! The perfect kitchenware is like the perfect pair of shoes. Makes you feel like million bucks whether you’re lounging around the house or showing them off to family and friends. In an extra large soup/stock pot warm olive oil over medium heat and sweat the onions and peppers with a pinch of salt and pepper until they appear translucent – about 4-5 minutes. Increase the heat to high, add in turkey meat and begin to brown. Season the turkey with salt, pepper, cumin, thyme, garlic powder, and chili powder. Once the meat is browned, add in the beans, tomatoes, and tomato sauce. In a small Mason Cash Mixing Bowl, dissolve the cornstarch in the cold chicken broth and add to the chili – stir to combine. Add in remaining ingredients – apple cider vinegar, ketchup, seasoning, and bay leaf – and simmer over low heat for 40 minutes. Serve warm in a Size 42 Mason Cash Pudding Basins. Cut lettuce into bit sized pieces. Pour in tangerine slices and slice avocado into a large Pacific Merchants salad bowl. Use a bottled mango dressing or you can use a home made dressing using white wine vinegar, olive oil, aged balsamic vinegar and garlic salt. 1. A great pair of jeans that make your … well you know what I mean. 2. A pair of high heels that don’t hurt your feet, and that are SO FABULOUS that you want to be buried in them. 3. A red lipstick, not just any red lipstick, but one that is the perfect color for you. When you put it on… VA VA VOOM – movie star! 4. A best friend, someone who will compliment you on your jeans, gasp over your shoes, and tell you when the lipstick is all wrong! 5. A famous cookie recipe – a signature cookie that turns you into a celebrity. A cookie that makes your fans cheer when they see you coming in the door with a plate full of them. I have a lot of jeans hanging in my closet, but I always choose “that pair”, they just feel right. I have at least 30 wooden spoons next to my stove, but without thinking, I always choose the same one. My favorite wooden spoon is burnt and chipped – I don’t care, it’s my “go to” spoon. I also have way too many knives, they all sit nicely in a container on my counter. I don’t know who I’m trying to impress with all these knives – I reach for the same one every time I cook. I pull the same bowls out everyday, my Mason Cash mixing bowls. There is something regal about them. Maybe it’s knowing that the Queen of England gives them away as gifts or that Martha Stewart loves Mason Cash. 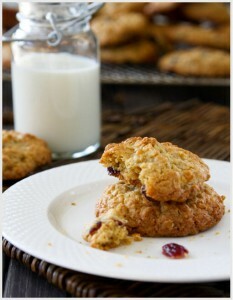 Whatever it is, I feel a little “royal” using them when I bake my “go to” dessert – cookies. Yes, cookies. What? Were you thinking that because I’m a chef I should be baking up something extravagant? Listen, cookies make people happy! Creme brule might woo some, others may insist on some delicate French pastry , but I’ve never met a soul who passes on a good cookie, it’s simply unAmerican. Friends, family, and clients know… I don’t share my chocolate chip cookie recipe – I can’t, let’s just leave it at that. 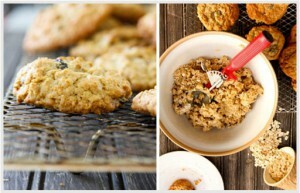 I will, however, share with you my oatmeal cookie recipe. Adjust your racks to the center and lower third of your oven. 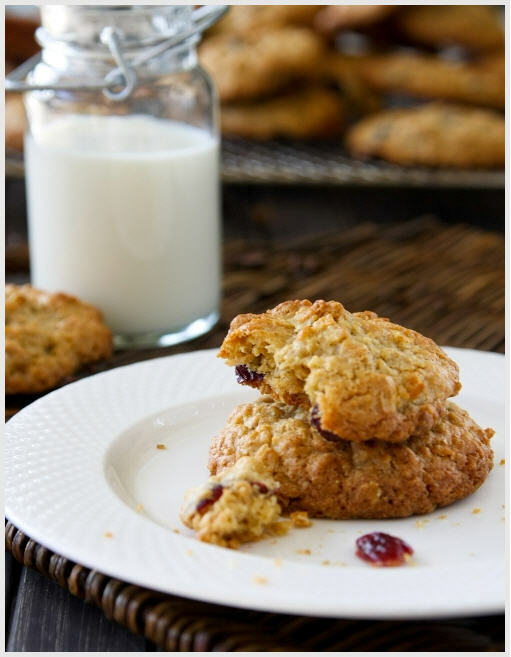 Place oats onto a lined cookie sheet and bake for 10 minutes – when done remove from the oven and allow the oats to cool completely. In a medium bowl combine your flour, baking powder, kosher salt, nutmeg, and cinnamon- with a fork lightly mix together to combine all of the ingredients. Attach the paddle to your standing mixer and in the bowl combine orange zest, room temperature butter and sugars. Cream the sugars and butter on medium for approximately 2-3 minutes – scraping down the sides half way through. Turn the mixer speed down to low and slowly add in the eggs and vanilla. Continue to mix for about 2 minutes or until eggs are completely combined. On low ,add in your flour all at once and continue to mix on low until almost completely combined – about 30 seconds. 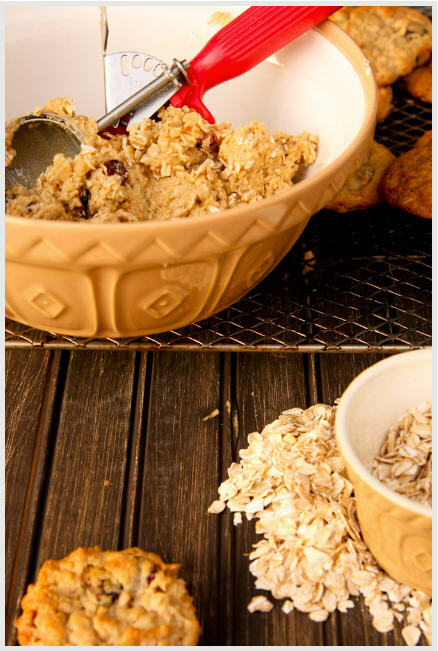 Add in your oats, nuts, and cranberries – mix for about 30 seconds until just combined. DO NOT OVER MIX. Place the bowl into the refrigerator for approximately 20 minutes to allow the cookie dough to set slightly. Bake for 12-14 minutes or until cookies are golden around the edges. Cool cookies on a wire cookie rack and store in an airtight container.